With our new printable map feature, you can choose from several versions of fun things to do in Dallas, Texas or create a personalized itinerary of your own top 10 things to do in Dallas! If you’re interested in romantic things to do in Dallas, you and your significant other can plan a magnificent trip all around the Arts District, including the Dallas Museum of Art and Nasher Sculpture Center, enjoy a horse-drawn carriage ride around West End Dallas, and end your evening with an exquisite meal at The French Room. If you have kids, you can plan a trip of fun frivolity, laughter and learning, that includes stops at the Dallas World Aquarium, Perot Museum of Nature and Science and Klyde Warren Park, just a few of Dallas’s family-friendly attractions, located in or around the West End. 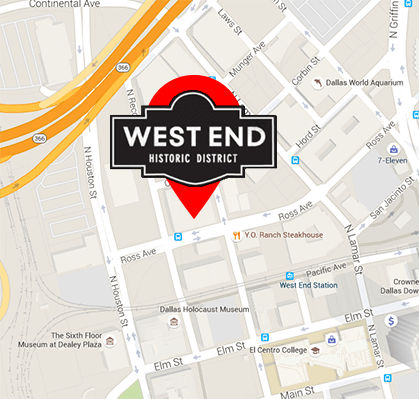 If you’re a history buff, West End Dallas is a must-see destination. From The Sixth Floor Museum and Dealey Plaza to the Old Red Courthouse, Dallas’s history is rich and deep. The area that would become the West End originally consisted simply of a trading post, established by Dallas founder, John Neely Bryan. In July 1872, the Houston & Texas Central Railroad arrived in downtown, attracting manufacturing companies whose warehouses defined the architecture of the West End; that architecture is still intact for tourists to enjoy today after the West End Historic District was listed on the National Register of Historic Places in November 1978.